The Meigs County Commissioners recognized Developmental Disabilities Awareness Month during their recent meeting. Pictured are representatives from the Meigs County Board of Developmental Disabilities and area provides, including, Meigs Industries and Inclusions. 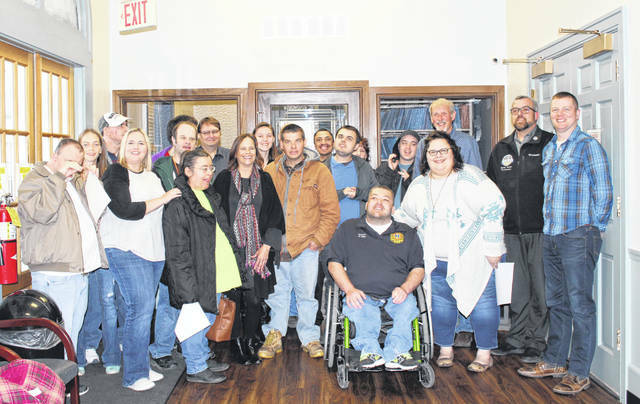 POMEROY — Numerous individuals were in attendance for the Meigs County Commissioner meeting last week as the board recognized Developmental Disabilities Awareness Month. Each March is recognized in Ohio as Developmental Disabilities Awareness Month. Ohio’s county board of developmental disabilities were established by the Ohio General Assembly on October 25, 1967. The mission and purpose of Ohio’s county boards of DD remains as strong as ever, with county boards continuing to provide vital supports and resources for Ohioans with developmental disabilities and their families. People with developmental disabilities served by the Meigs County Board of Developmental Disabilities, their families, friends, neighbors, and co-workers encourage everyone to focus on the abilities of all people. The most effective way to increase this awareness is through everyone’s active participation in community activities and the openness to learn and acknowledge each individual’s contributions. We encourage all citizens to foster and support such opportunities that include full access to education, housing, employment, and recreational activities. The Meigs County Commissioners do hereby proclaim March 2019 as Developmental Disabilities Awareness Month and offer full support to efforts that assist people with disabilities to make choices that enable them to live successful live and to realize their potential. We urge all citizens to join in their celebration by spreading awareness of the many contributions offered by people with developmental disabilities in our community. In other business, the commissioners approved the appointment of Tim Ihle to replace Mike Bartrum on the Transportation Improvement District Board as recommended by Engineer Gene Triplett. The board approved the IV-D contracts between the Meigs County Department of Job and Family Services and the Prosecutor’s Office, Clerk of Courts and Juvenile Court for child support cases. A contract for jail housing was approved with Morrow County at a rate of $60 per day for each prisoner. The commissioners approved to certify and appropriate $71,475.98 for the county engineer’s office in FEMA grant funds. These funds are from the early 2018 disaster declaration and are a reimbursement for project completed.